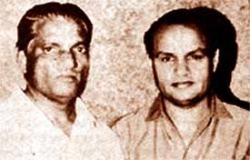 Husnlal and Bhagatram were younger brothers of Pandit Amarnath, a famous composer of the 40's. Husnlal was accomplished violinist, and also a good classical singer. Bhagatram was an ace Harmonium player. They both worked as assistants for Pandit Amarnath. Husnlal & Bhagatram beacme the first music director who worked as a pair. They got their first break in the film 'Chand' in 1944. They gave their first hit with 'Do Dilon Ko Yeh Duniya..' sung by Manju. Husnlal Bhagatram popularised Punjabi folk music, and their range of music has a rare lilt and rhythm. They became the most sought after composers with the success of films like 'Pyar Ki Jeet' and 'Badi Bahen' in the late 1940's. Though many sad songs have been recorded before the song 'Ek Dil Ke Tukde Hazaar Huye..' (Pyar Ki Jeet) sung by Mohd. Rafi, got released. But this song gave a new dimensions to the sad songs. Mohd. Rafi got many sad songs after this one. According to Husnlal Bhagatram they had to put great efforts to make this song an instant hit. 'Ek Dil Ke..' was written by Qamar Jalalabadi, but according to him he did not wrote this song for 'Pyar Ki Jeet'. He wrote it for 'Sindoor' in 1941 but Shashidhar Mukherji, director of 'Sindoor' rejected the song and declared it 'useless'. Later, O P Dutta, director of 'Pyar Ki Jeet' heard it and was so excited that he changed the picturisation according to the demand of the song, and Husnlal Bhagatram proved him right, as the song became an instant hit soon after the release of the film. Husnlal Bhagatram gave first break to Panjabi folk singer Surinder Kaur in 'Pyar Ki Jeet'. Surinder Kaur sang four songs in 'Pyar Ki Jeet'. Before 'Pyar Ki Jeet' Surinder Kaur used to sing Panjabi non-film songs, and with 'Pyar Ki Jeet' she came to Bombay. It was a major break for her. Their songs became a big rage. They composed the famous song "Suno Suno Ai Duniya Walo, Bapu Ki Yeh Amar Kahani", sung by Mohd. Rafi. This song became very popular all over the nation. Husnlal Bhagatram mostly used voices of Rafi, Lata, and Suraiya, who sang her own playback. They used songs written by Qamar Jalalabadi for most of their films. They parted ways by the late sixties. Husnlal left for Delhi and Bhagatram stayed on in Bombay. Husnlal died in December 1968, and Bhagatram expired in November 1973. Husnlal's family resides in Delhi, and Bhagatram's son Ashok Sharma is a noted sitarist with Doordarshan, and lives in Mumbai with family.